Finally, it starts to get interesting. Pitching is Theo’s top priority at the Winter Meetings. It looks like we’re shifting our focus from Roy Halladay to John Lackey. That’s very good news. I don’t want to give up both Clay Buchholz and Casey Kelly for a pitcher who is, in all likelihood, past his prime. Yes, it’s possible he could be another Randy Johnson, who won four straight Cy Youngs after turning thirty-five, or Curt Schilling, who was a Cy Young runner-up three times after turning thirty-three. But it’s also possible that he just won’t deliver or that he’ll become a medical liability or, worse yet, the dreaded combination of both. (See Randy Johnson in pinstripes. Talk about disasters.) And if you compare the two, Roy Halladay doesn’t even enjoy a complete edge in the numbers. In his career, he started and won more games, struck out more batters, and had a lower ERA, OPP AVG, and WHIP. But Lackey’s gone the distance more often (which translates to durability, one of Lackey’s strongest assets) and has allowed fewer earned runs, home runs, bases on balls, and hit batters. And we land Lackey this offseason, it would be through a signing, not a trade, so we wouldn’t have to mortgage our future. Besides, we theoretically have some money left over from our decision to not pick up Alex Gonzalez’s option. Supposedly, we’re also seriously pursuing Rich Harden. I like that less. He’s got a 3.39 career ERA with 783 strikeouts and a record of fifty and twenty-nine, but he’s never thrown two hundred innings in a season and has only made more than twenty-six starts once. Durability? Not so much. But he’d be a good bargain option, arguably a better one than Smoltz or Penny, because he’s pitched in the American League. Speaking of pitching, the Braves cleaned out two of our peripheral relievers. Wagner signed a one-year deal worth seven million dollars to close for them. I would’ve liked to see him come back to Boston, but he did give us fair warning that he wanted to close, and we don’t exactly have a vacancy in that position. One day later, the Braves signed Saito also, to a one year deal worth just over three million plus incentives. I’m not too torn up about it. Say hello to the latest shortstop to don a Boston uniform: Marco Scutaro. If I sound cynical, it’s because I am. He’s wearing Number 16; the last Boston shortstop to wear Number 16 was Edgar Renteria, so here’s hoping this time around will work out a little bit better. Let’s not kid ourselves: he’s a veteran. He’s a career .265 hitter with fifty home runs, 294 RBIs, and 297 walks to his credit. But he’s thirty-four years old. There’s a reason why the deal was only for two years. It’s worth eleven million dollars plus a dual option. Things that made this possible: the draft pick we’re getting from the Braves that will offset the one we have to give to the Jays, another undisclosed team pushing hard for Scutaro that forced the issue, and Scurato has reached that point in his career when he really wants a ring. (Ironically, Alex Gonzalez signed a one-year deal with the Jays earlier, worth close to three million plus an option.) Either way, we now have a shortstop who is not Dustin Pedroia. That needs to be cleared up once and for all. Dustin Pedroia said he would be willing to play shortstop if the team needed him to. But the team wasn’t about to let that happen. Trust me. You don’t move a Gold Glove second baseman to short because you don’t want to spend some money. You don’t do that for a number of reasons. Not the least of which is the fact that it doesn’t solve anything. Fine; you move your second baseman to short. Now you need a second baseman. Sure, the market for second basemen is more fluid than that for shortstops, but not when you’re talking about second basemen as good as Dustin Pedroia. Also, the caliber of Pedroia’s defense at short would be comparable to, if not worse than, any career shortstop on the market, with the obvious exception of Julio Lugo. Thirdly, shortstop is no defensive walk in the park. It’s the most difficult infield position. And that means it carries a higher probability of injury, especially for someone who’s not used to it. So we would have lost valuable playing time from him, both in the field and at the plate, had he made the switch. Would he have been capable of doing so? Absolutely. If anyone could, Dustin Pedroia could. If there’s one ballplayer who embodies the don’t-tell-me-I-can’t-‘cause-I’ll-show-you-I-can attitude, it’s him. Not to mention the fact that in 2003 he was the NCAA National Defensive Player of the Year at short. And he’s actually in a better position to play shortstop at the Major League level now than he was when he first came up, due to his offseason workouts and in-season conditioning that have made him lighter and faster. But even though he’d use his baseball acumen to compensate, his range would leave much to be desired. And sometimes, in pressure situations in that part of the field, the range of the shortstop is what it comes down to. It would have put considerable pressure on Mike Lowell to improve his range as compensation, that’s for sure. So while I’m not doubting Pedroia’s ability to make the switch, I don’t think it would be a good for him or the team in the long run. The team wasn’t actually serious about that possibility anyway. Ultimately, Theo never would have allowed it. Thankfully, it’s a moot point now either way. But that would explain our earlier interest in Placido Polanco. After the Tigers declined to offer him arbitration, we made a call or two. But like I said, we don’t need a second baseman, and even if we did, he was all but off-limits. The Phillies have since closed the deal. So much for Chone Figgins, who ended up signing a four-year deal with Seattle. Last but not least, we extended arbitration to Bay earlier this week. (We declined offers to Baldelli and Byrd.) That means that, even if he signs with someone else, we get compensatory draft picks. So the saga continues. Congratulations to Joe Castiglione, Dave O’Brien, and Jerry Remy for landing on the ballot for the Hall of Fame’s Frick Award, honoring the baseball’s best announcers. They definitely deserve it. We beat the Lightning and the Leafs. Not so much the Habs. We lost, 1-5, to Montreal. Ugh. That was just an awful game to watch. Even with that loss, though, we’re in first place in the Northeast! Finally! One point ahead of the Sabres, but I’ll take it. But the most significant B’s news this week has nothing to do with wins and losses. Marc Savard signed a seven-year extension. Ladies and gentlemen, that could very well be the highlight of the regular season. It’s going to have a hugely positive impact it’s going to have on our future. There is arguably no other center in the league who is as multi-faceted and deeply talented as Marc Savard. Things aren’t as cheerful on the football front. Talk about awful games to watch. The Saints defeated us, 38-17. Yeah. Awful. We celebrated the fifth anniversary of our complete and total decimation of the Yankees in the 2004 ALCS on Tuesday. Just thinking about that 10-3 final score gives me goosebumps. That was the greatest day in the history of New England for all of a week before we won it all. World champions. I said this at the time, and I say it every year, because it’s true: it never gets old. No matter how many wins anyone else may be able to rack up, none of them will ever measure up to 2004. Ever. And no defeat will ever be as painful as the one the Yankees experienced. There’s a reason why it’s called the greatest comeback in the history of baseball. And I wouldn’t have wanted to get to the big stage any other way. Meanwhile, Tim Bogar and Brad Mills interviewed for the Astros’ managerial job. That’s not something I want to hear. Mills has been our bench coach for the past six seasons, and he’s done a great job. Obviously I’m rooting for his success, but I just hope that success is achieved in Boston, not in Houston. And supposedly we’re chasing Adrian Gonzalez via trade. This could get very interesting, very quickly. At twenty-seven years of age, he hit forty home runs, batted in ninety-nine RBIs this year, led the Major Leagues in walks, and finished the season with a .407 on-base percentage. But wait; the plot thickens. One of our assistant GMs, Jed Hoyer, is about to become the Padres’ GM. (This leaves Ben Cherington as our only assistant GM. The decision is likely to be announced in the next few days. Bud Selig doesn’t want clubs making such major announcements during the World Series, so it’ll happen beforehand, especially since Hoyer will need to get his personnel in place and prepare for the GMs meeting starting on November 9.) So if one of them lands the job, our options become wide-open, and the road to the trade just got re-paved. The important question here is who is on the block. I wouldn’t be surprised if it’s Mike Lowell and prospects; Youk would then move to third permanently while Gonzalez plays first. But I don’t know if the Padres would bite. I think it’s safe to say Youk won’t be going anywhere; he’s too good at the plate and in the field. And I don’t think Pedroia even enters into this discussion. So I think Lowell, prospects, and bench players are up for grabs. Speaking of Pedroia, check this out. During his MVP season, he swung at the first pitch fifteen percent of the time. This past year, that stat was down to seven percent. Furthermore, during his MVP season he hit .306 with eight doubles and two dingers on the first pitch. This past year, he hit .167 with four hits, period. And if you don’t consider his one-pitch at-bats, his numbers from the two season are almost exactly the same. But there’s a trade-off. With more patience came twenty-four more walks and a comparable on-base percentage despite the thirty-point drop in average. And while we’re on the subject of examining the season via stats, the only Red Sox catcher since 1954 who’s had a better average in September than Victor Martinez is Carlton Fisk. Just to give you an idea of how ridiculously awesome V-Mart is. 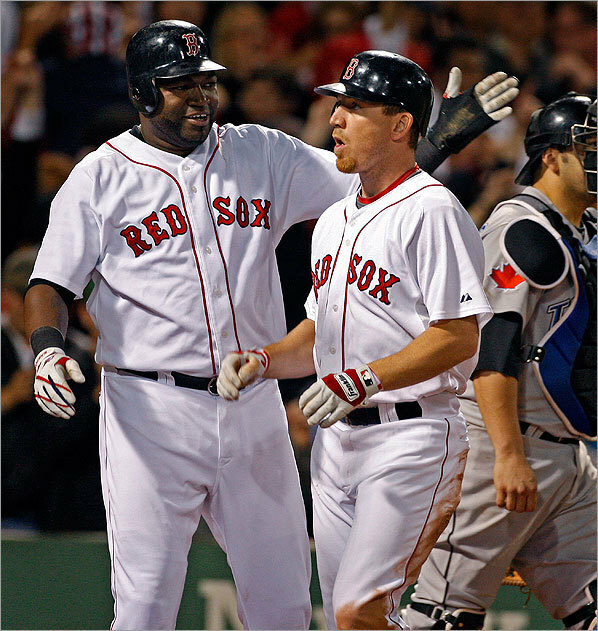 Youk has had the highest OPS in the American League since 2008. (It’s .960, a full ten points higher than A-Rod’s. I’m just sayin’.) Jacoby Ellsbury is one of only six since 1915 to bat over .300 with forty-five extra-base hits and seventy steals; the other five are Ty Cobb, Rickey Henderson, Willie Wilson, Tim Raines, and Kenny Lofton. David Ortiz hit more home runs than anyone in the AL since June 6, but only six of those were hit with runners in scoring position and struggled immensely against lefties. In three of his past four seasons, Jason Bay has experienced a slump starting sometime in June and ending sometime in July that lasts for about a month. Saito cleared waivers on Monday, but mutual interest in his return has been expressed. Why not? He finished the year with a 2.43 ERA, the eighth-lowest in the Majors for a reliever with forty-plus appearances. Wakefield had surgery at Mass General on Wednesday to repair a herniated disk in his back. The surgery was successful, he’ll begin rehab immediately, and expect him to be pitching before Spring Training. In other news, Los Angeles Dodgers owner Frank McCourt fired his wife, Jamie, from her position as CEO of the organization. Ouch. Now she’s amassing an army of investors in an effort to possibly buy out her husband. Ouch times two. This could potentially ruin the team; when the organization’s top officials are preoccupied with marriage and ownership disputes, it’s harder to focus on free agency, harder to allocate funds to the right players, and therefore harder to be good. Not that I’m complaining; Joe Torre and Manny Ramirez blew it this year and I’m looking forward to the Dodgers dropping down in the standings. That’s a wrap for this week. Not too much goes on until the stove gets hot, but this is when Theo gets his winter game plan together. If there’s one thing we can count on, it’s that he’ll be making some serious moves. After a postseason finish like ours, that’s really the only thing you can do. The Pats crushed the Titans last weekend. Seriously. The final score was 59-0. It was ridiculous. The Bruins, on the other hand, could do better. We lost to Phoenix, shut out Dallas, lost a shootout to the Flyers, and won a shootout to the Senators. We traded Chuck Kobasew to the Wild for right winger Craig Weller, still in the AHL; rights to forward Alex Fallstrom, a freshman at Harvard; and a second-round draft pick in 2011. So it could be a while before we see a return on this move, but it freed cap space in preparation for next offseason, when Tuukka Rask, Blake Wheeler, and Marc Savard all hit the free agent market. And make no mistake: Peter Chiarelli was sending a message. If you underperform, you’re gone, because we can use the financial flexibility of a trade to make us more competitive than you’re making us right now. That went horribly. That went horribly, and October is not the time for “horribly.” Lester took the loss. He gave up three runs on four hits in six innings with four runs and five strikeouts. I should mention that those three runs scored courtesy of a Torii Hunter home run. By the way, Lester threw one hundred pitches. In only six innings. In October, one hundred pitches should be getting you through the seventh inning. But wait, it gets worse. Ramon Ramirez, Mr. Struggle-in-September, came to the mound and proceeded to pitch to three batters and allow two more runs without recording an out. Saito and Bard were both solid. Make no mistake: our bullpen is a huge advantage over any opponent we face. The lineup did nothing. We got four hits all night, none of which were for extra bases. The final score was 5-0. We need Ellsbury to give us something. And now let’s talk about the umpire, shall we? Let’s start with first-base umpire CB Bucknor. As the similarity between his last name and a certain someone else’s during the 1986 World Series doesn’t make me uneasy enough. Both of these calls involved Howie Kendrick at first. And you can watch replays of both and see that Howie Kendrick was about as out as you can possibly be. Question mark number one: with two out in the fourth, Kendrick hit a grounder up the middle, which Gonzalez fielded very schnazzily (it was a sliding catch; very nicely done) and fired to Youk at first. But the throw was wide, so it pulled Youk off the bag. So Youk applied the tag, but Bucknor called Kendrick safe. Question mark number two: in the sixth, Kendrick grounded to Lowell, who fired high to first. Youk jumped up to catch it but came back down on the bag about four feet before Kendrick got there. And yet somehow Kendrick was safe? Tito had some words for Bucknor, and rightfully so. Fortunately, neither of those plays cost us runs, the first one because Lester struck out Jeff Mathis to end the inning and the second because Jacoby Ellsbury made an absolutely spectacular diving catch of Chone Figgins’ fly to end the inning. But that’s not the point. I don’t want any more of this going forward. Speaking of defense, it was awesome. Everyone was spot-on, which was a sight for sore eyes, given all of our recent health concerns. JD Drew got in on the action and gunned down Kendry Morales at the plate in the seventh. Byrd is on the roster, and Delcarmen is off because of, you guessed it, the car accident. Baldelli is also off, replaced by Brian Anderson and Joey Gathright. The Billy Wagner trade is finally complete; the Mets picked up Chris Carter and first base prospect Eddie Lora. Don Orsillo did a fantastic job, as always. Believe it or not, there are some silver linings to last night’s horror show. First of all, we shouldn’t worry about Lester. It’s the first game of the playoffs, we were away, he’s got some nerves. Secondly, the outcome of last night might play directly into our hands. To borrow some logic from hockey, Andy Brickley said yesterday on NESN that the Bruins’ bad loss to Washington was a necessity for us to remember who we are and how we play, and it facilitated our running wild all over the Hurricanes. (Brickley said that before we lost to Anaheim, 6-1, which is eerily similar to our good score against Carolina and last night’s outcome against the Angels, but again, that’s not the point.) So last night, in many important ways, was a wake-up call. It reminded us that October is not all fun and games. You can’t just waltz into the playoffs and expect the series win to be handed to you on a silver platter. You have to earn it the hard way, and sometimes, that means you won’t sweep. So, okay. The first game is over, the jitters are gone, we’re comfortable in the Angels’ park now. The Angels is throwing Jered Weaver tonight, but forget that. 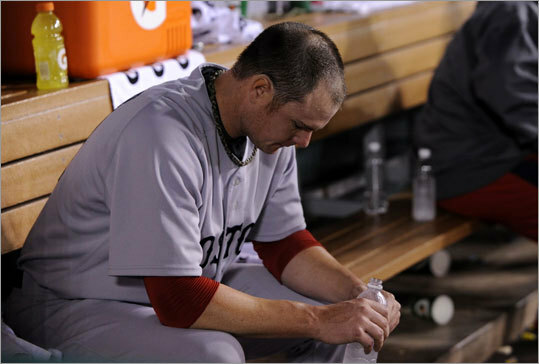 Tonight, Josh Beckett makes his first postseason start of 2009. He threw a bit the other day and says he feels great. This is what I was talking about when I said I liked the Thursday schedule. We lost yesterday, but we’ve got another chance right away to remember who we are. And there’s no pitcher out there who can make you remember faster in the postseason than Josh Beckett. The 2009 season is officially over. It’s amazing how time flies when you’re having fun. Seriously. It was a great season. Plenty of highs, plenty of lows, plenty to celebrate, plenty to scratch your head and have no idea what’s going on. But now we have the second season on our hands: the postseason. And with the approach of the postseason come the all-important roster decisions that must be made to give us the greatest ability to advance to the World Series. This is what Terry Francona may have in mind, with a little help from the Portland Press-Herald. As far as the pitching staff is concerned, there’s no surprise there: Lester, Beckett, Buchholz, and Dice-K, in that order. Lester is starting first because, had it been the other way around, one of them would’ve been on normal rest and the other would’ve been on ten days’ rest. Plus Lester had the better second half, plus Lester is the go-to man for Game 4 should we find ourselves in a hole. Or we could use Beckett on four days’ rest for Game 4 and Lester on five for Game 5 since there’s an off day between the two, but I’m not a fan of that option. Tito hasn’t announced the starter for Game 4 yet, though. No surprises in the relief corps, either: Papelbon, Bard, Wagner, Okajima, and Ramirez. Saito and Delcarmen will fill out the bullpen. Wakefield has officially been scratched, Michael Bowden is still pretty new, and Byrd, while he could be a long reliever, wouldn’t necessarily be as effective. Yes, Saito and Delcarmen (especially Delcarmen) have had their struggles, but that’s why it’s called the second season. You take a rest, you put it behind you, and you record punchout after punchout. If I need options for innings in October, I want Saito’s experience and Delcarmen’s power. But Delcarmen’s health may eliminate him; after the car accident this weekend, his back and neck are pretty sore. The infielders are obviously Youk, Pedroia, Gonzalez, Lowell, and Kotchman. Nick Green’s back and leg will probably keep him off the roster, so Jed Lowrie and Chris Woodward will probably come on as utilities. Jed Lowrie can hit in the clutch (I refer you to his grand slam on Sunday), and Woodward can flash leather, even if he can’t buy a hit. The outfielders are obviously Bay, Ellsbury, Drew, and Baldelli, and you really can’t get much better than that. We have three options with which to fill out the outfield: Joey Gathright, Josh Reddick, and Brian Anderson. Brian Anderson is out; his speed, glove, and bat don’t compare to the other two. Gathright has remarkable speed, but Reddick has a remarkable bat. So you’re basically choosing between a clutch steal and a clutch hit. Dave Roberts’s heroism wills all of Red Sox Nation to go with Gathright, but let’s remember that Dave Roberts’s steal only counted in the long run because Bill Mueller singled him home. And it’s not like Reddick has no speed at all. On the other hand, it’s not like Gathright has no bat at all, and it’s been Gathright who’s been seeing playing time recently as part of the reserve. So I think Gathright is the answer. And we may need him more than ever because of Baldelli’s hip injury. The designated hitter will be David Ortiz. Obviously. And now for the lineup. It’ll be Ellsbury, Pedroia, V-Mart, Youk, Ortiz, Bay, Drew, Lowell, and Gonzalez. If it’s a righty. If it’s a lefty, Baldelli will take Drew’s spot. If Tek catches, that’s a whole different story, and Tito will have to do some serious finagling to accommodate that. Look for Tek to be at the bottom of the order. Boston may have the most well-rounded team heading into October however one thing I’ve noticed is that the offense struggles a lot versus good pitching. The line-up will pound a bad pitcher or a pitcher with an off night and the offense will explode. However, for most of the season there has been very little output against great pitching. And that has to be concerning. Because that’s what your likely going to face come playoff time. Jeremy makes an excellent point. Remember when we played the Tigers in June? We swept. We didn’t face Justin Verlander. Remember when we played the Royals in July? We took three out of four and didn’t face Zack Greinke. We just played the Royals again and split a four-game set, and one of the games we lost was pitched by, you guessed it, Zack Greinke. We’ve been very lucky this season with pitching schedules, but this luck is about to run out. The teams you face in October are guaranteed to be the best of the best, and part of what makes them so good is their pitching. There’ll be no escaping a Justin Verlander or a Zack Greinke in the postseason. So I completely agree with Jeremy, but I don’t think it’ll affect the outcome of our October. The ALDS is a big reason why. Playing the Angels in the ALDS is kind of like a warm-up for the rest of the month, but it’s a warm-up that counts, so you get all the pressure of the October stage, including great pitching, with all the confidence of having a pretty good feeling that you’ll advance. 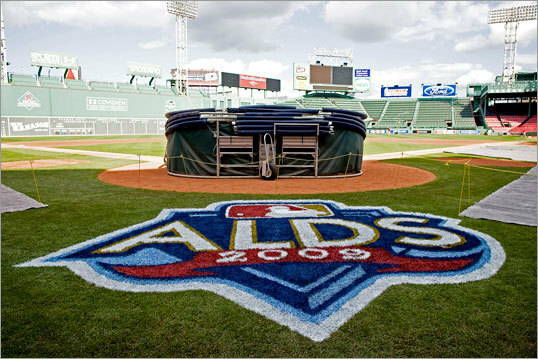 Now, you’ll notice that in both 2004 and 2007, the ALDS wasn’t enough to remind us who we are offensively, which is probably why it took moving ourselves to the brink of elimination and facing postseason death in the ALCS to remind us that, yes, we actually are capable of handling these arms. Between the ALDS and half of the ALCS, we play a lot of games against quality pitchers, so by the time we’re almost out of the playoffs completely, we come roaring back and get ourselves to the World Series, where we obviously have no problem with the National League. And let me tell you, it helps in the long run, because nobody wants to be the team that finishes the ALCS early and just sits around waiting for the Fall Classic. I refer you to the Rockies in 2007. We are exactly where we need to be to make this October count. The Yankees played the month of September like they had something to prove. And they did. You don’t spend a quarter of a billion dollars on three players in the offseason and not win the division. But at what cost, both literally and figuratively? It is entirely possible that the AL East is the kiss of death for New York; they’ve exhausted all of their resources. I refer you to 2004, when they ramped it up big time in September specifically to win the division, which they did by a hair. Then they lost steam in the ALCS, and look what happened. Regarding how the teams stack up, we’re pretty even, and most of the gaping holes are in our favor. We’re much better at home than they are on the road, hit many more home runs, have a higher team slugging percentage and ERA, and our bullpen ERA is much higher. We also had a better September, which is key. We’ll need David Ortiz to handle Brian Fuentes, and we’ll need Bard to be in top form as a set-up man. The Angels’ problem will be scoring runs, so if our starting rotation keeps us in it, we should be able to come away with a win. So that’s it. All we have to do now is wait. Let’s start this party. Dice-K turned in a nice tune-up last night. Six innings, two runs on five hits, three walks, seven strikeouts, and that’s not bad for a fourth postseason starter. I was disappointed that he threw 104 pitches in only six innings; usually a total like that should be getting you well into the seventh. But he’s made great progress and, with a solid relief corps, we’ll be okay. Wagner, Ramirez, Bard, and Saito combined for three shutout innings. It took Ramirez two hits and twenty-four pitches to turn in an inning of work, so my guess is Tito probably won’t be going to him first and foremost in October. 6-2 was the final score. 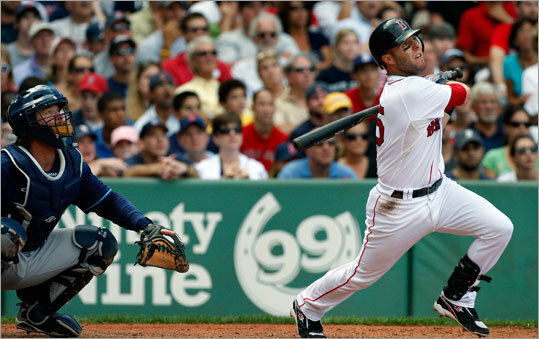 RBIs for Pedroia, Bay, and V-Mart; Youk had two. Ellsbury doubled, stole, and got caught. He has sixty-nine steals on the season and will probably end up with at least seventy before it’s over. He’s only been caught twelve times. Sixty-nine SBs and twelve CSs. You can’t get much better than that. V-Mart went two for four. Youk doubled and made a fielding error. No, seriously. Bay went two for four with a double. Tek doubled. No, seriously. Baldelli made a nice sliding catch in the second to put away Travis Hafner. I have some bad news, though. Gonzalez was plunked on the right wrist with a fastball in the eighth and had to leave. He’ll go for x-rays today. Baldelli strained his left hip flexor while running out a grounder in the fourth and had to leave. Make no mistake: we can not afford to lose Gonzalez. Not now. Somehow, he’s gotten his hitting together in 2006, and we need him in there. Especially when you consider the alternatives; Jed Lowrie and Nick Green both have health issues already. As for Baldelli, we need him to be available during starts by lefties. So this is not good. John Farrell has stated publicly that is completely focused on and committed to the Red Sox. He won’t be becoming the Tribe’s manager when he has a World Series win on the line. Two more games and then we’re done. Aaron Laffey and Josh Beckett will match up tonight. This is an important start because this is Beckett’s first start since receiving cortisone in his back. So much like Lester, we’ll need to make sure he’s good to go. In other news, the Bruins take on the Hurricanes tonight at home. Let’s get it right this time. That was one of the most unusual clinchings I have ever seen. That was because, strangely, we didn’t clinch. The Rangers clinched for us. We lost, 8-7, to Toronto, but if the Rangers lost last night, we were officially in. But the Rangers were in Anaheim, so it was a late start, so after our game, the players sort of trickled out of the ballpark but stayed in the area to return to celebrate a Texas loss. I heard Daniel Bard went to his apartment across the street to have dinner, Ortiz went out somewhere in the area, and Pedroia put his son to bed. But when the Rangers lost, just before 1:00AM, almost the entire team was on hand to break out the champagne, because ladies and gentlemen, we officially won the Wild Card. Ladies and gentlemen, we are officially going to the playoffs! On the backs of the Texas Rangers, but who cares! We were getting there ourselves one way or another anyway. As for our game, it’s both concerning and dismissable. On the one hand, it was a loss, and by Clay Buchholz, who pitched horribly. Honestly, he looked like his old 2008 self. Seven runs on eight hits with a walk and four strikeouts. Five home runs. Five. I’m not making this up. Four were solo shots; two were lead-offs, one with one out, and one with two outs. The other home run was a two-run shot by Adam Lind, who would go on to hit two more. The man finished the night with three home runs. Three. Seriously. Not once in all of last year did Beckett allow five home runs, and home runs were his big issue! And Clay Buchholz has to allow all five in one game right before the playoffs? Is he trying to send all of Red Sox Nation into collective worry? At least he was efficient; he threw less than eighty pitches. Ramirez was good, Saito allowed a sixth home run, and Wagner and Papelbon were both good. Especially Papelbon, who took care of the ninth in seven pitches. Like I said, the final score was 8-7, so the offense put up a good fight. Ellsbury went two for five and stole, Pedroia went three for five with a double and a caught stealing, V-Mart and Youk each batted in a run, Ortiz went two for four with a double and an RBI, Bay walked twice and scored twice, and Drew went three for four with a towering three-run shot with two out in the eighth. That was a huge home run. It made me think of his grand slam in October 2007. So at least we know his bat is ready if we need it. Aside from Buchholz, on the other hand, we have to consider the fact that Toronto always does this. We consistently have trouble with them in the month of September, and the later in September we play them, the more trouble they give us. I remember we almost lost the division in 2007 because we played them and Eric Gagne was on the mound. (Although the narrow outcome of that particular game had more to do with Gagne than with Toronto.) But one more run and we would’ve headed to extra innings, where we would’ve won it and clinched the conventional way. But a clinch is a clinch, and you have absolutely no idea how psyched I am for October. The second season. It’s almost here, for the sixth time in the past seven years! But Tim Wakefield had a point. The fact that the team celebrated as one at the ballpark despite the circumstances speaks to the team’s character. It takes a pretty uniquely special group of guys to feel that a playoff berth was deserved and hard-won together no matter how it may have technically been made official. But wait; it gets better. We’re facing the Angels in the ALDS! Again! For the third year in a row and the fourth time in the past six years! And the best part? We’re nine and one in all of those series and have won all of them! Meanwhile, Halladay at Wakefield. This is just as much for Wakefield as it is for October’s starting rotation. Wakefield needs playing time so he can recover, and October’s starting rotation could use a rest. This is the best time of year, and with the Yankees series this weekend, it feels like it’s October already. This could be it. After last night’s win, we reduced our magic number to three. We could clinch in Yankee Stadium and celebrate on New York soil, and that, ladies and gentlemen, is absolutely, positively, without a doubt something to smile about. But let’s talk about last night first. The final score was 10-3. 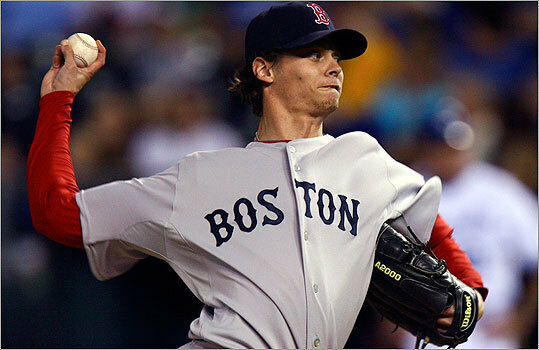 Buchholz was brilliant and was not responsible for any of those runs. Six and two-thirds shutout innings pitched. No walks. Eight strikeouts. If he didn’t allow five hits, he would’ve been on his way to a perfect game. But even with the five hits, that outing was absolutely brilliant. You can’t even get an outing like that out of some veterans, let alone some young upstart who had a horrible season last year. But he’s on the rise. All of his outings this year have been at least decent, and this was his sixth straight quality start. He’ll be starting in October. Just watch. It was Ramirez who was responsible for the runs. All three of them. He recorded only two outs but gave up three runs on three hits, partly the courtesy of Billy Butler, who hit a two-run shot off him in the eighth. In some ways, this is more concerning than if Buchholz had given up the runs, because this is a star of the bullpen we’re talking about. We all know the importance of the bullpen in the postseason. Now more than ever, they need to hold it together. Especially Ramirez and Delcarmen, who haven’t been at their best lately. Saito wasn’t great either; he pitched the rest of the game and allowed two hits and a walk. Ellsbury went three for six with an RBI and two steals. Pedroia went two for five with a double and an RBI. Martinez went two for five with a walk. Bay was hitless but walked. Ortiz had a fantastic night, going three for five with a double, a walk, and three RBIs, one of which came on a leadoff homer in the fourth that he absolutely crushed. Lowell hit and walked twice. Kotchman and Gonzalez both went two for four with a double and a walk. Gonzalez also stole. Reddick walked twice. So every single member of the starting lineup reached base at least once. Needless to say, this was not Kansas City’s best work, but with five errors and two ejections, it was pretty entertaining. Zack Greinke was ejected in the third for heckling home plate umpire Greg Gibson. Then Anthony Lerew knocked Lowell’s helmet off in the fourth with a curveball, so Gibson warned Lerew and both benches. Trey Hillman came out and had the liveliest exchange with an umpire that I’ve seen in a while, and he got tossed. And the words continued even after that. I’d say this particular crew was pretty sensitive. I don’t think Lerew was trying to hit Lowell on purpose. If you’re going to hit a batter on purpose, you do it with a fastball, not an off-speed pitch that’s notoriously difficult to control. Congratulations to Terry Francona for recording his 561st win last night! With that win, he surpassed Mike Higgins to reach second place on the Red Sox all-time list, right behind Joe Cronin. That’s heady company! And so it begins. Lester will take on Joba Champerlain in the Bronx tonight at 7:00PM. There’s really nothing else to say, is there. Except perhaps the always-appropriate, “Go Sox!” Let’s dominate.